Just want to say up front that I really appreciate all the interest and support this year, you all have been unbelievably kind and generous. I'm extremely fortunate to have so many fine people collecting, using and enjoying my crazy little creations. Thank you so VERY much! Today I have some titanium BedBugs finished. These are very light and handy little guys. They have a plain stonewashed finish and come with #1 Phillips bit, two sets of #204 O-rings and a stainless #.5 S Biner from NiteIze. I may not bother to make any anodized titanium captive bit tools partly because fresh O-rings tend to leave a little bit of oily residue on the metal which dulls the colors slightly and is tough to clean. Anyway, they're great just the way they are so I'm not going to worry about it. Titanium BedBugs run $45 plus shipping and once again it will be a limit of two on them. Probably it's too late to get anything there before Christmas given the tremendous volume of packages and the delays that are already underway with the post office. Regardless, I hope everyone has a wonderful and relaxing Christmas and all the best for 2013! These are gone for now, thank you so much! Holy Smokes, that's a lot of people! Thank you all so much for all the interest, it's very much appreciated! Congratulations to the winners and thanks again to everyone who signed up! I'm sending out emails right now. It's rainy and gloomy here this week but that's better than a foot of snow so I'm not complaining too much. So far we are getting off pretty easy this winter. Today I have a small number of SnakeBites done. These are what remains from the old batch that I made several years ago. 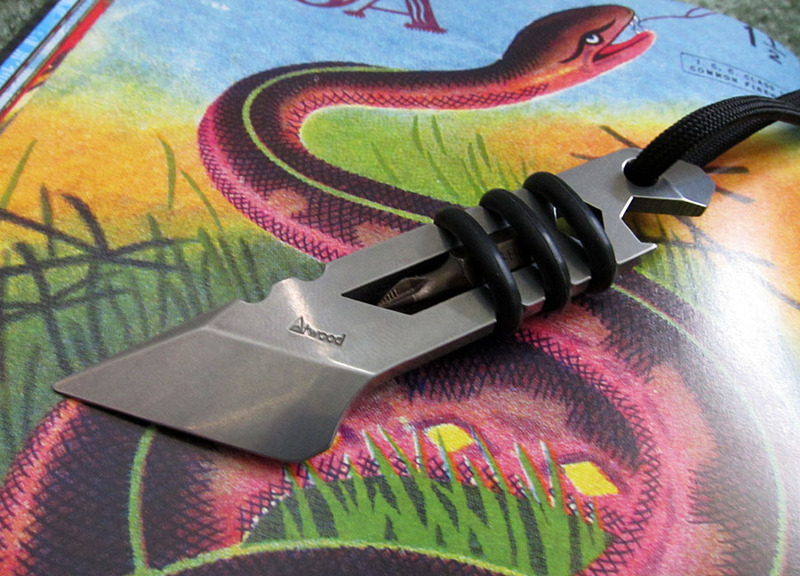 They are 5/32 (.160) S30v with stonewashed finish and come with kydex sheath and bead chain. They make a great little neck knife or pocket tool kit. I have just 12 SnakeBites available. They will run $185 plus shipping and the sign up link is below. Since we are getting close to Christmas I think Express Mail is the way to go on these so within US it will be $15 and for International it will be $35. The SnakeBite SUSale will run until 7PM Eastern Time tonight, December 18th. I will end the sign up at that time, remove the sign up link, and send emails to the winners shortly afterwards. Thanks for stopping in and I hope everyone is gearing up for a great holiday season! SnakeBite Sign Up is over, thank you so much folks! I will post the list of winners and send out emails to them shortly. Anyway, today I have some more of the Count Sporkula tools done. These are the 301 stainless steel ones. There are a couple of stonewashed pieces but most of them have a light glass bead finish on them. These are great wallet tools and would be perfect little stocking stuff type items. They run $45 each plus shipping. I'm going to limit to two per customer as the batch is sizable but not huge and I did carefully check the sales page this time to make sure the limit is set to two. My apologies for all the confusion earlier this week! Stainless ones are gone for now, thank you so much everyone! It's a cold, rainy and dreary day here but at least it's not snowing. Great day to hunker down with a hot drink and do a sale. This is a new item that I've been planning for a few months. The BedBugs are a simple bit caddy tool and a good excuse for me to get to play with a variety of materials. Because of the simple design I can use some metals which are a little softer than usual since there is no pry function or cap lifter to get chewed up. So the first wave of these are in warm and lovely bronze, alloy 510 which is a spring tempered bronze. These are already beautiful but will develop a great patina over time. I encourage you to handle these frequently, get them wet, spill stuff on them, rub dirt into them and ding them up because they will just get better and better looking as time goes on. I can't wait to see what they look like in a year or two. I'm on a campaign to save my fingers this winter so I decided that instead of putting all these together I would let you all have some of the fun...hehe. So these will ship with a little bag containing two sets of rubber O-rings, a #1 Philips bit and a small NiteIze S clip and you guys can put them together yourselves. I love these little clips btw and you'll be seeing them again as I have some other tools I want to use them with up the road. Definitely handier than a lanyard for certain things. The BedBugs will run $45 each plus shipping and I'll put a limit of two per customer on them so hopefully a few more folks will have a chance to pick one up. As always, thank you so much for stopping by and I hope everyone is having a great week so far! BedBugs are Sold Out for now but I have lots more coming so no worries! Thank you!